The new webcam image that has me changing my initial assessment is a fixed camera at the Los Angeles International Airport operated by the Countryman & McDaniel law offices (www.cargolaw.com). This camera has given me a known, fixed point of view and an exact timestamp to work with. Again, using Google Earth and the flight tracks of UPS902 and AWE808, it became clear, based on this image, that UPS902 is the better flight for this contrail. The track is nearly spot on! There still are a few degrees of uncertainty based on approximate superimposition of the webcam image on the Google Earth view. I also believe that the 3-engined MD-11F that was used on that route that day would produce a larger, denser contrail. How do I account for the difference in the observed contrail and the flight path above? The contrail could have been blown to the south by high altitude, prevailing winds. This idea is discussed at length at contrailscience.com. Also, at the time of the image, 5:15 (the camera's timestamp is an hour off, probably due to a lack of ability to observe daylight savings), AWE808 was SE of LAX, while UPS902 was approximately 160 miles off the coast, putting it right where it needed to be for that webcam to capture it. Fliight 802 superimposed over a still photo from the KBCS footage. One of the most bothersome aspects of this entire affair was the number of variables in the KBCS footage. Most "missile theorists" are counting on the vague nature of this film to ensure their theory stands. If the film remains a variable, their theory holds more water (in their eyes, of course). Thankfully the footage contains usable, identifiable landmarks that can be easily used to provide a heading for the camera, which will in turn pinpoint an origin of the contrail. 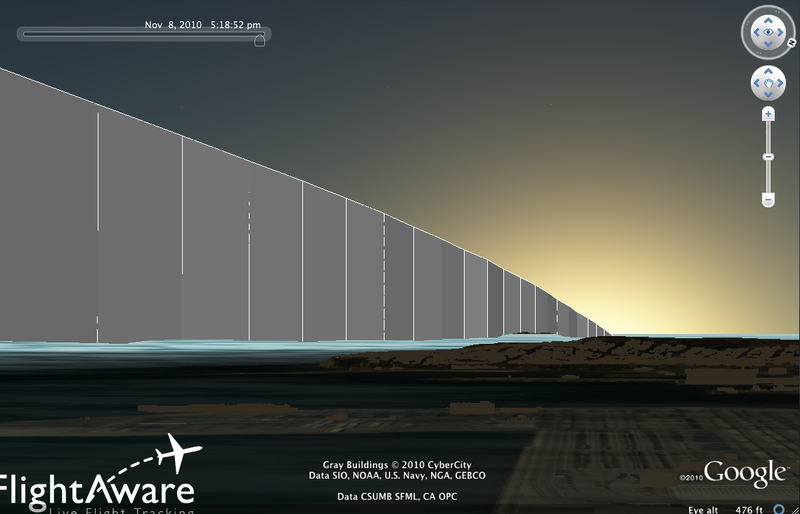 Using Google Earth's Photo overlay feature, I was able to use the lights of the terminal and the countour of the hills that lead away from Point Fermin, as well as the approximate location of the horizon to create this image: Please compare it to the above image as well as the original video. I believe you will find that I did not alter it in any way. Unsurprisingly, the flight track of UPS 902 lights up precisely. Here are the coordinates, heading, field of view and other parameters I used to recreate the view in Google Earth. There still are values that can be adjusted to yield a smilar view, particularly the field of view and distance from the terminal. This is due to having no data on the magnification of the telephoto lens employed by Gil Leyvas, though he did indicate that he was using a 2x teleconverter, which means he was effectively doubling the power of the existing lens. Perhaps the most important data point that can be gleaned from the superimposition is the determination of the direction that the camera was pointed, at least for that particular scene of footage: 246 degrees, approximately WSW. 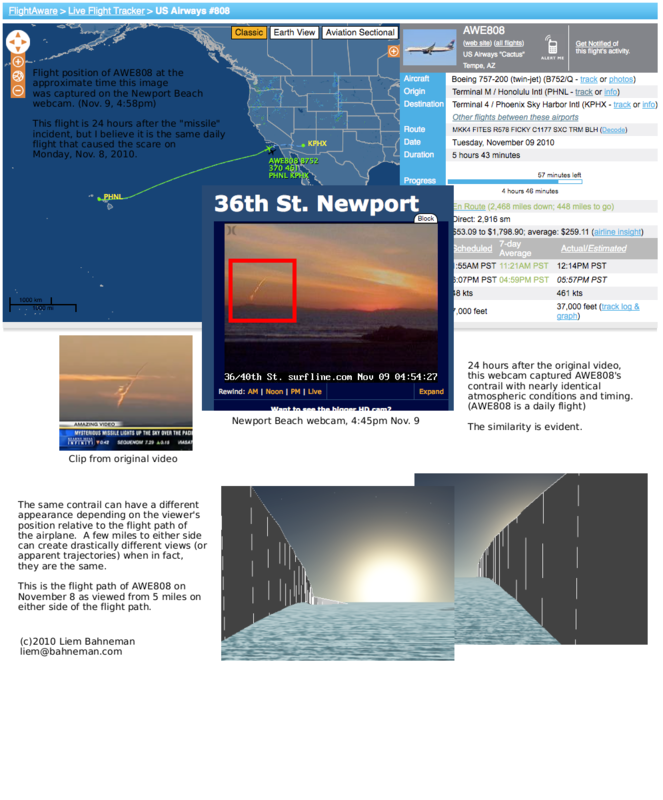 A satellite image of the contrail as imaged by GOES WEST, animated by "timewstr" on abovetopsecret.com which shows the contrail, and the corresponding drift of that contrail in the prevailing winds, which correlates to the image above from Long Beach. I added an overlay of the UPS902 track to illustrate that the contrail lines up precisely with UPS902's Nov. 8 flight path. So, there you have it. While the flight AWE808 theory I made initially (on this blog, WCCO radio, and the CNN's Situation Room) was incorrect, I still adamantly stand by my theory that the contrail was the roduct of a commercial airliner and not a missile or rocket launch. I wonder if I'm the first to call it, the reported unexplained missile launch off the coast of California, was US Airways 808. I did a lot of extrapolation of what flights could be at the right position (off the coast) at the right altitude (for contrail formation) and came down to two possibilities: UPS flight 902 (UPS902) or US Airways flight 808 (AWE808). As I was researching tonight (24 hours later), I realized that today's AWE808 current position (at around 4:50pm) was almost the same as it was the day of the incident. I quickly pulled up a Newport Beach webcam and found tha (apparently) AWE808 was making an identical contrail, 24 hours later! The comparison is quite clear. A remarkably similar, less-hyped, contrail created by the same flight almost exactly 24 hours later! So, based on that, and the flight track of AWE808 24 hours earlier, I believe the mysterious missile off the coast of California on November 8, 2010, was in fact the contrail of US Airways flight 808, a flight originating in Honolulu , HI (PHNL) and ending in Phoenix (KPHX). I'm about 80% certain this is the right flight, though UPS902 is still a contender. For some additional explanation of this non-event, take a look at the Contrail Science blog. I respect that people will see what they want to see, particularly when it lines up with their interest. Military missile men will see a missile. Conspiracy fans will see a conspiracy. Military pilots will see an fighter jet. Myself? I'm an aviation photographer who also dabbles in weather and atmospheric phenomena. So I see a commercial airliner and its contrail, however, I also believe that this is an excellent example of Occam's Razor: "the simplest explanation is more likely the correct one." With those variables nailed down, in conjunction with the sun angle, an expert should be able to pinpoint exactly, the trajectory of the object. Meteor experts extrapolate this kind of information on almost a daily basis in their tracking of meteor or satellite debris entering our atmosphere. (My responses to these are my opinion. I'm not a meteorologist or aerospace engineer). You would naturally make that assumption. However, a contrail, at 39,000 feet is often subject to high winds. Depending on the velocity and direction, it can spread out contrails in a matter of minutes. (These contrails often turn into feathery cirrus clouds.) The contrail created at the distance where it appears to meet the horizon has had sufficient time to spread out with the wind. Remember, the distance as viewed through a zoom lens appears to be shorter due to an optical affect called "foreshortening". - Why can't the FAA or Pentagon just identify the aircraft and settle this whole thing? I would imagine that other than checking in with all of their departments for confirmation that it wasn't military activity, they probably don't feel that this common, everyday event is worth the resource expendature. I would imagine that is the same for the FAA. They have better things to do than worry about this non-event sensationalized by the news and internet. - AWE808's flight on November 8 was a Boeing 757-200, with twin, wing-mounted engines, yet the video footage clearly shows a single contrail. Viewed nearly head-on, as AWE808 was to the camera, the brief separation would be nearly indiscernible, especially when you're talking tens of miles of separation. I'm not saying that the same atmospheric conditions prevailed on November 8; I believe that even if there was a longer distance to convergence of the twin contrails, their appearance would be mitigated by the angle of the flight path to the viewer. - What was the airplane that passes in front of the camera? I had originally dismissed this airplane as having any sort of relation to this story, as there are, at any time, hundreds of civilian aircraft flying in the LA area at any given time. However, a lot of the missle theorists think that this is somehow related to the missile launch, perhaps a helicopter of some sort watching the launch or securing the area of the launch. Given the very limited resolution of the source KCBS video, it will be impossible to positively identify the type of aircraft, I do believe I can eliminate another airliner and a helicopter from the equation. First, the shape does not fit any commercial airliner or business jet. The shape does not properly fit a helicopter either. I belive the silhouette matches a common Cessna 172 or similar type aircraft. The real hint to me was the location of the beacon, which matches a wingtip beacon. - How are you qualified to offer any sort of definitive solution to this mystery? Like I said, I'm fairly familiar with the use of flight tracking software to track planes (in a personal effort to photograph them). Being in the hobby for a number of years, you pick up on such things as flight plans, flight paths and the like. Commercial aircraft often fly the same route between airports, with some variation due to weather and the like. I am also proposing this as a theory that I'm fairly confident in. My word is neither official nor definitive, they are my own conjectures as determined by the tools at my disposal and level of expertise.